House Bill 179, Possession of Weapons on School Property, was withdrawn today prior to introduction by its sponsor, Rep. Ari Porth (D-Coral Springs). The bill would have criminalized of common pocketknives at school sponsored events, on school property, school buses, or at a school bus stop. Incredible as it seems, a boy scout found in posession of an official Boy Scout pocketknife would have been charged with a THIRD DEGREE FELONY under the ill-conceived bill. In an over-zealous crusade against the tool, rather than the misuse of it, Rep. Porth was willing to destroy the future of children, parents, faculty, and staff. This is simply unforgiveable. What's next? Nail clippers? 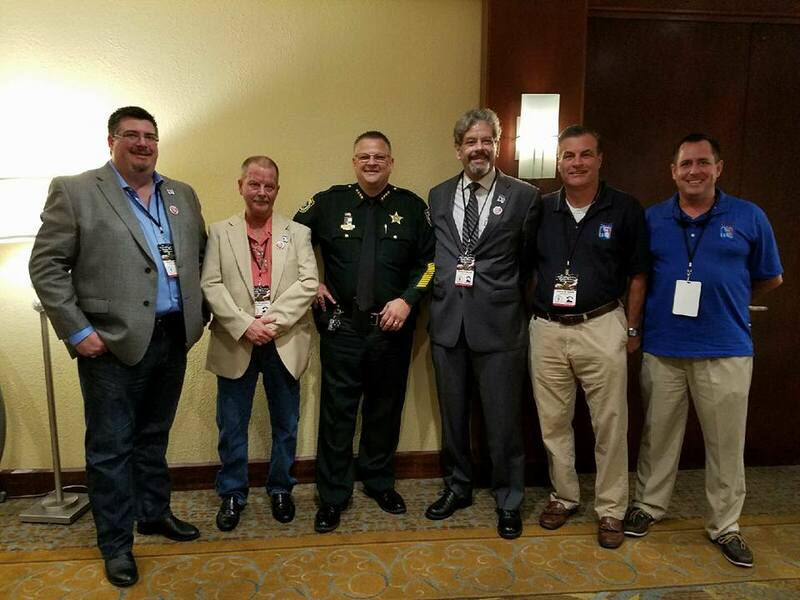 Florida Carry and its membership, in close association with KnifeRights.org, takes great pride in leading the charge to get this bill squashed before it created unknowing felons out of the very cream of American youth, the Boy Scouts. Florida Carry, Inc. has today filed a lawsuit against the University of North Florida (UNF), seeking a permanent injunction from enforcing its unlawful ban on firearms and weapons. We also seek a court order to repeal their unlawful regulations and remove all preempted signs/publications. Since 1987 the Florida Legislature has preempted firearms law and issued statewide licenses to carry for self-defense. No public college or university has any athority to prevent students from having a firearm in their car as long as the firearm is lawfully possessed under state law. Any public college or university which attempts to restrict students’ rights on this issue is subject to being sued under Florida Firearms Preemption law which was amended this year to make the 24 year old statute easier to enforce by organizations like Florida Carry. Orange County Sheriff's Office releasing private gun owner info - Request for special prosecutor. Florida Carry, Inc., through our attorneys, has requested that Governor Scott appoint a special prosecutor to investigate felony violations of state law by the Orange County Sheriff’s Office. Sheriff Demings' department utilized secure police databases, intended for use in the enforcement of law, for his office's lobbying efforts and made private gun owner, concealed firearms licensee, and driver's license data public despite multiple state and federal laws. Orlando area State Attorney Lawson Lamar's Office has refused to fully investigate this issue and cleared high ranking members of the Sheriff's lobbying team of any wrongdoing within days despite clear violations of state and federal law. There is a clear conflict of interest when the local prosecutor is tasked with investigating the department he relies on to bring him cases. A Special Prosecutor is necessary to remove any bias or perception of impropriety. Click the links here to see the reply to our request for investigation from the Orlando Area State Attorney's Office and our subsequent letter to Governor Scott requesting a Special Prosecutor be appointed. We urgently need you to email Governor Scott NOW! 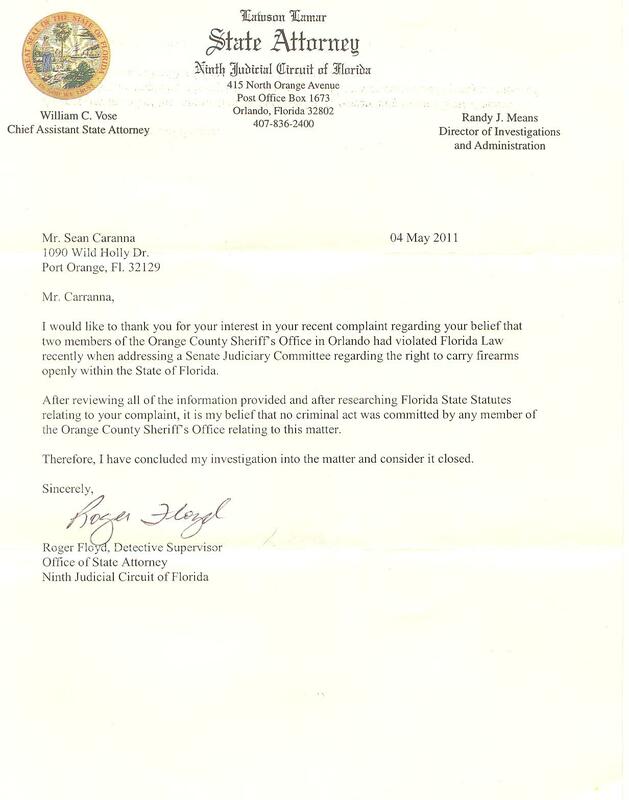 SUBJECT: Please appoint a special prosecutor for OCSO! This e-mail is to express my great concern that senior members of the Orange County Sheriff's Office utilized the private personal information of Florida gun owners, obtained from secure law enforcement databases, for their lobbying efforts in Tallahassee. This data is intended for use in the enforcement of law, not release to the public to support a political agenda. Despite state and federal law, an Orange County Sheriff's Captain in charge of the lobbying office released Driver's License photos in a list of Concealed Weapons/Firearms License (CWFL) holders and Gun Owners before testifying before a Senate Committee considering SB 234. Florida Carry requested an investigation be opened by the local State Attorney but received a letter, days later, saying that there was no violation of law. I join Florida Carry in asking that a Special Prosecutor be appointed to investigate the felony release of a gun owner list, CWFL data, and other protected personal information. There is a clear conflict of interest when the local prosecutor is tasked with investigating the department he relies on to bring him cases. A Special Prosecutor is necessary to remove any bias or perception of impropriety. As you probably know, we worked hard during the last legislative session to help pass Florida's Firearms Preemption Enforceability Bill (HB45). The new law will allow us to hold public officials accountable for violations of state law in their attempts at gun control. 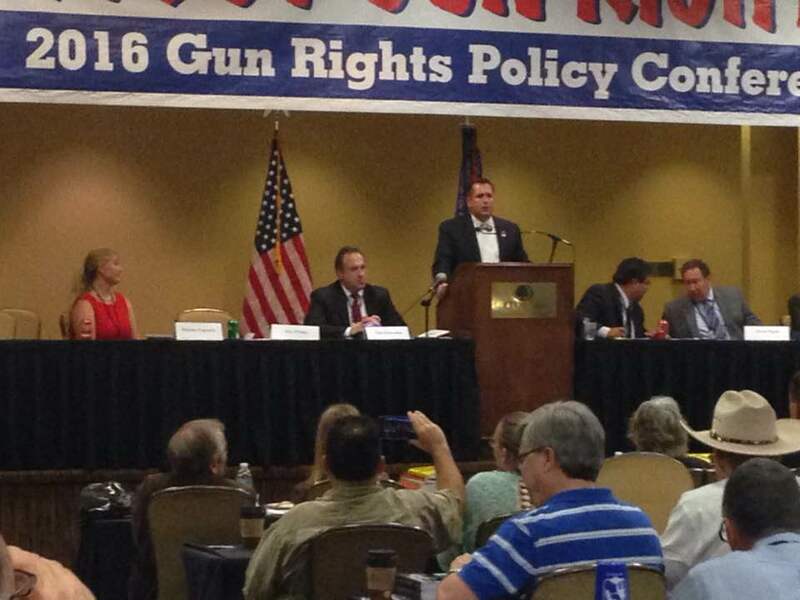 We have worked in good faith with jurisdictions and agencies across the state to remove their anti-gun laws and regulations and are pleased to report that most have responded to our efforts by repealing their firearms regulations. A few have decided to test our resolve. We will begin filing cases on Monday, Oct. 3rd that will impact gun owners across the state and quite frankly, we need your help. These cases are expensive to file and our political strength is in our grassroots membership. 44 States allow lawful carry of firearms in the common terminal and baggage claim areas of airports. There are federal laws that restrict firearms, knives, and other weapons in the "sterile area" beyond the security checkpoint but the unsecured areas of the terminal are subject to state law. Florida, and only five other states, make the entire airport terminal off limits even to carry license holders while armed. The US Supreme Court made it clear in DC v. Heller (2008) that Americans have the right to "carry weapons in case of confrontation," but this right can be restricted "in sensitive places". The Federal government has determined that the "sterile area" is the "sensitive place" at an airport but Florida has gone much farther and banned even licensed carry inside the entire terminal, on this topic Florida is one of the most restrictive places in the country. This has lead to confusion in the past even outside the terminal. In one case a lawful concealed carry licensee had his firearm become accidentally exposed while helping to unload luggage for someone who he was dropping off at the airport. Airport police overreacted and he ended up cuffed on the sidewalk outside until the officers realized their mistake. These incidents don't happen in the states where the limit on carry is clearly defined as in the "sterile area". Florida Open Carry - SB 234 Final Push! URGENT! SB 234 Press Release - E-mail request from Florida Open-Carry.org and Florida Carry, Inc.